Spectacle can offer various video production services tailored to your needs. You can hire equipment, hire a crew to document events, hire editing desks or one of our experienced editors. We convert different formats (including Hi8 and Super8) and offer digitalising and backup of video and image archives. Spectacle can undertake the whole video editing process of both documentary and drama projects and master them onto MiniDV / DV Cam and DVD. We can take care of voice-over recordings and supply voice-over artists. We can involve you and your co-workers in both editorial and production processes. We also offer training on camera operation and editing software for individuals or groups (see also Community and Campaigns). If you do not find the information you are looking for on these pages, please get in touch. 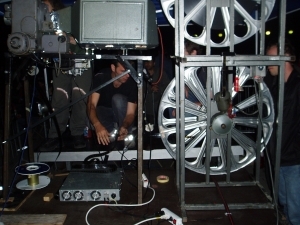 Filmmaking and video production can be a long and arduous process; Spectacle's processes are transparent and its unique archive system ensures consistent contact and input with clients. This means that projects can be constantly monitored and evolved with the client. Its multi-skilled freelancers are familiar with a range of production equipment and post-production programmes, allowing a wealth of options for final outcomes and diversity of expertise in project management. Please do not contact us for ideas for documentary or other film productions. All our ideas are developed in house. Spectacle offers professional HD and SD video and photographic production and documentation services for online, print or DVD distribution. Spectacle can provide fully equipped and highly experienced HD /DVCam / DV camera and sound crews. Our crews have experience of a variety of broadcast and non-broadcast productions, and are used to working in sensitive and difficult situations. Crews can bring lights (handheld and on stands,) steadi-cam junior, Sennheiser microphones, SQN etc as required. Spectacle offers a sliding scale, depending on funding and size of production. For enquiries or a quote for any of our facilities please send us an e-mail.